or perhaps a window handle or cupboard knob..... I find it seriously difficult to part with even the tiniest scraps of fabric, it seems so very wrong to throw fabric away, even the smallest of off-cuts. So I try to use every last little piece whenever possible and am forever looking of new ways to incorporate these orphaned scraps. These little hearts are perfect for utilising those precious pieces of fabric and any project that involves dipping into the button jar is sure to make me smile. 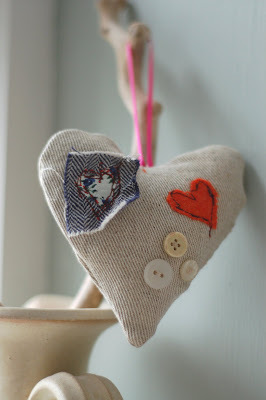 I have hung them from an old piece of driftwood in the study were they cheer up a rather grey windowsill no end. I have added the hearts to the Handmade at Poshyarns shop and now find myself developing a sudden urge to decorate for Valentines day. Oh they're lovely! I'd just started thinking about Valentines earlier this week and was worried I was getting ahead of myself. So glad I'm not the only one thinking about hearts. Though I would have to keep those hearts up year round! They are so nice! I know what you mean about scraps, I have basket loads!! These are absolutely sweet! I feel the same way about buttons . . . stitching . . . fabric . . . ::sigh::!! Love your work! Everyone ought to decorate for Valentine's Day - we need all the boost we can get, this dreary time of year. 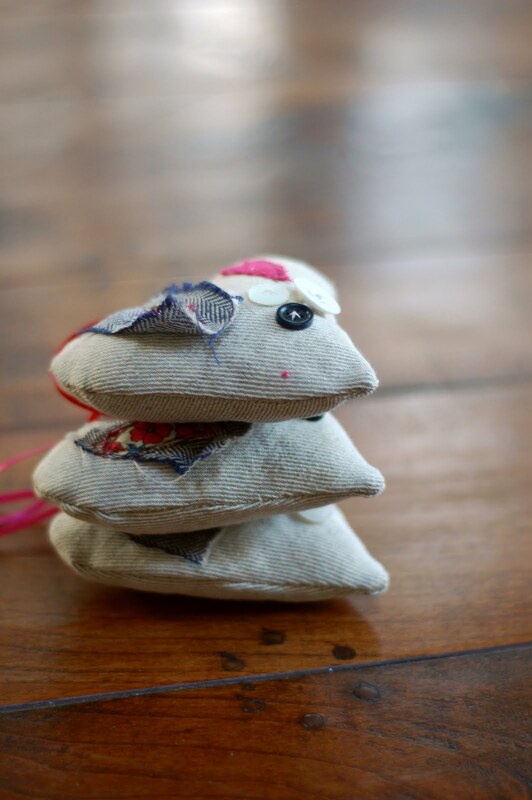 If you had a cat, you could make little catnip sachets! I like your hearts and agree that I would hang them all year around! Oh my! Those little hearts are adorable! Hung on a string and strung from side to side, they would add visual sunshine to any room! So pretty! I love using all those little scraps, I'm terrible at throwing anything away - I have a whole bag of teeny scraps to use one day for "stuffing"! 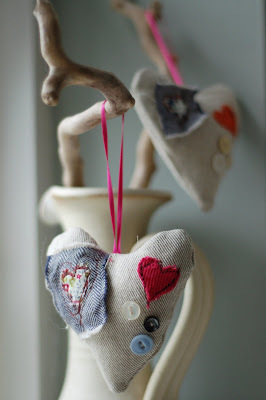 Gorgeous hearts, is it really nearly Valentine's already? Really romantic and sweet! Have a good one! Those are adorable. I love the little red hearts on the bigger hearts! Oh they are so cute! as soon as I saw that first photo I thought of how cute they would be on a valentines tree. Happy new year to you! I can't believe we are already two weeks into it and that I am back at work....ugh...what a shock to the system. I'm awful for not throwing anything away. I will probably end up as one of those old ladies who has jars of string in the attic that are far too short to be useful! Lovely hearts - I think you can never have too many. They certainly prettify most door knobs and handles in my home. They are SO cute, I just love anything with button decorations! Beautiful and really make me want to make some more myself. I have some with tweed or a mix. But the red really makes them sing. I'm the same with scraps of fabric too - you never know when they might come in handy! I like the hearts, very pretty plus everything looks better with a button or two. PS. I did enjoy the knitting from a couple of posts ago! Beautiful! What a great way for using left over fabric scraps and buttons. You can fill them with lavender too and hang in coats to keep the moths away. And thanks Rebecca, I wish you a great year too!